Symptoms of depression can be made to disappear in less than two hours with a common anesthetic, not the weeks or months required for onset of relief with traditional antidepressants, according to results of a pilot study. Be aware that this study reports results of a small off-label trial of a drug that is not approved for treatment of depression. Discuss approved pharmacologic and behavioral treatments for clinical depression with patients who express interest in ketamine injections. "We have broken the sound barrier in depression treatment," said Carlos A. Zarate, Jr., M.D., chief of the mood disorders section the National Institute of Mental Health, who reported on the effects of ketamine, a common anesthetic, in the August 8 issue of the Archives of General Psychiatry. Dr. Zarate and colleagues said a single injection of ketamine, which targets the N-methlyl-D-aspartate (NMDA) receptor, can eliminate depression symptoms within 110 minutes. A drug used as a general anaesthetic may also work as a remarkably rapid antidepressant, according to a preliminary study. The drug's hallucinogenic side effects mean it is unlikely to be prescribed to patients, but it could pave the way to new faster-acting antidepressants, the researchers suggest. Ketamine is used as an animal tranquiliser, but is perhaps better known as an illicit street drug, sometimes called "special K". Now researchers have found the drug can relieve depression in some patients within just 2 hours - and continue to do so for a week. This is what’s so exciting about a treatment conducted by the National Institute of Mental Health (NIMH). It’s an injection, not a pill (No, that’s not the exciting part) of a substance called ketamine. 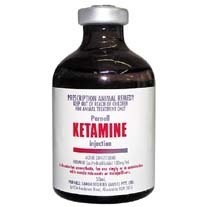 Since 1970, ketamine has been used as a general anesthetic for both humans and animals. Given in doses too low to cause anesthesia, it relieved depression in as little as two hours. The study, appearing in the August Archives of General Psychiatry, comprised 17 depressed patients randomly assigned to receive either an injection of ketamine or a placebo. For 71% of those receiving the real deal, depression improved within a single day. Indeed, 29% became nearly free symptom free. 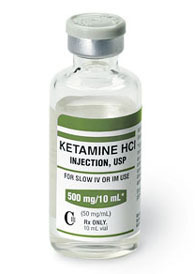 Thirty-five percent of patients who received ketamine were still feeling better a week later. Patients receiving the placebo reported no improvement. No patients had serious side effects. A week later, in a cross-over study, participants were given the opposite treatment unless they were still benefiting from the ketamine. Those with no benefit from the placebo were now helped while those who had received the real thing the first time but the fake stuff this time had no improvement. People with treatment-resistant depression experienced symptom relief in as little as two hours with a single intravenous dose of ketamine, a medication usually used in higher doses as an anesthetic in humans and animals, in a preliminary study. Current antidepressants routinely take eight weeks or more to exert their effect in treatment-resistant patients and four to six weeks in more responsive patients — a major drawback of these medications. Some participants in this study, who previously had tried an average of six medications without relief, continued to show benefits over the next seven days after just a single dose of the experimental treatment, according to researchers conducting the study at the National Institutes of Health's National Institute of Mental Health.